In today’s blog post, the fourth in a series that started with this one, we’ll take the self-organising map that we’ve been using in Parts 2 and 3 and rework it to provide one answer to the question of how many distinct position types there are. 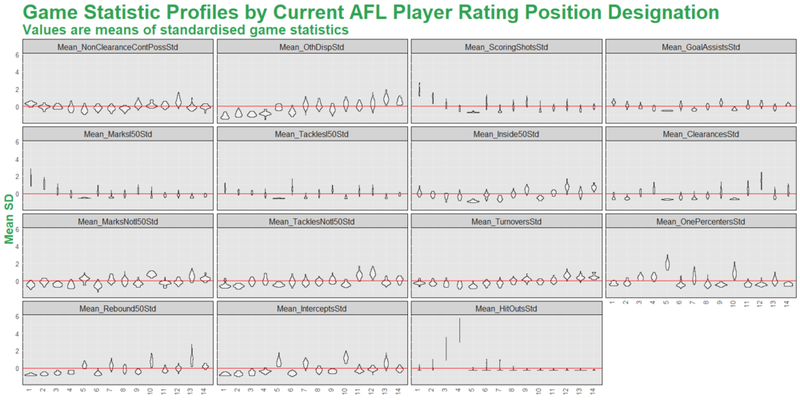 The AFL Ratings site implicitly posits 7 distinct types, but the data might suggest otherwise. That process yields a 14 cluster solution (based on the firstSEmax and globalSEmax) that I’ve overlaid on the map below. Viewed from the perspective of the underlying game statistics, the 14 position types can be summarised in terms of the standardised underlying metrics as we see in the violin plot below. Two (1 and 2) that involve mainly Key Forwards, one mostly a higher scoring, more i50 possession gathering, and more aggressive form of the other. The stat-producing abilities of those in Type 1 allows them to generate Brownlow votes at about two-and-a-half times the rate of those in Type 2 and at the second-highest rate of any type. Two (3 and 4) that involve mainly Rucks, one that is a Hit Out (and somewhat a Clearance) machine, and the other that generates more Scoring Shots and Marks and Tackles inside 50. Those in Type 4, generate Brownlow votes at three times the rate of those in Type 3, and at the equal third-highest rate of any type. Two (5 and 10) that involve mainly Key Defenders, one that is the One Percenter King (and doesn’t generate Contested Possessions), and the other that specialises in Intercepts, Rebound 50s and Marks outside 50, and, relatively speaking, Contested Possessions and Other Disposals. Neither type generates Brownlow votes at a high rate, though those in Type 10 do so more rapidly than those in Type 5. Two (6 and 9) that involve mainly Small/Medium Forwards, one that specialises particularly in Goal Assists, Possessions and racking up statistics inside 50, and the other that has broadly the same profile, but that generates statistics, other than Turnovers and Tackles inside 50, at a less extravagant rate. Those in Type 9 generate Brownlow votes at a rate four-and-a-half times that of those in Type 6, and at the equal third-highest rate of any type. Two (7 and 13) that involve mainly Small/Medium Defenders, one that specialises particularly in Rebound 50s, Marks outside 50, and Other Disposals, and the other than mostly is a lesser version in terms of measured output save for the fact that it tends to generate more One Percenters and fewer Turnovers. Those in Type 13 generate Brownlow votes at almost four times the rate of those in Type 7, but at only the sixth-highest rate of any type. Three (11, 12 and 14) that involve mostly Midfielders, one that specialises mostly in terms of Contested Possessions, Goal Assists, Clearances and Tackles outside 50, a second that is best known amongst Midfielders for its Marks outside 50 and Other Disposals, and a third that is dominated by at least one of the two other types (and usually both) on every metric. Players in Type 12 are the Brownlow vote generating machines of the competition, racking up votes at almost double the rate of any other type. Type 14s generate votes still at a relatively high rate, but less than half that of Type 12. Type 11s generate votes at less than one-sixth the rate of those in Type 12, and below the all-type rate. One (8) that comprises players from a range of positions who, combined, have statistics that are, at best equal to the all-player averages and, mostly, below them. Unsurprisingly, players in this type generate Brownlow votes at one of the lowest rates of all the types. A summary of the 14 position types appears below, along with archetypical examples of players from each type. Here’s one final graphic that brings everything together - the map, the players, the segments, and the profiles of each segment in terms of AFL player position designations and game statistics. To be clear, there’s nothing magic about our choice of 14 position types here - different data, different feature building or selection from that data, a different algorithm, or even a different analyst might’ve come to a different conclusion. Nonetheless, the data we’ve chosen and the analytic path we’ve followed together suggest that our conclusions are reasonable. A good guide, especially for those who’ve watched a lot of footy, is whether or not these persona ring true. As always. eager to hear your thoughts.